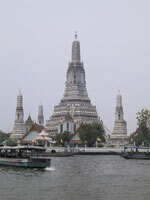 Bangkok is an amazing city. There is a vibe here which is unexplainable. Vendors flash fry food in pushcarts on the street while talking on their cell phones. The weekend market is filled with thousands of people and thousands of items, ranging from handcrafts to fake Rolexes to live animals. Everywhere you go, the people are friendly, the shopping is wonderful and the food is even better. And did you know this? The Kingdom of Thailand has never been occupied by any foreign power in it's history!